You’ve probably heard of Kodi by this point (which is why you are here) but you might not really understand how useful it is and how easy it is to configure it. Well, I’m here to help so just follow along and by the end, you will have everything you need to know to configure a TV Box that does everything you need it to! There have been significant crackdowns over the last few months on illegal streaming. This is due to the ISPs blocking users access to streaming sites, causing Kodi errors and streams not opening or constantly pausing. Luckily, if you use a good VPN, your traffic will be anonymous and encrypted so your ISP won’t be able to see what you are doing online. My VPN of trust is IPVanish. It offers the fastest connections and also a strict no logs policy, meaning your traffic history will not be stored and cannot be used against you. Save 57% of IPVanish VPN - Click here to get the deal now. 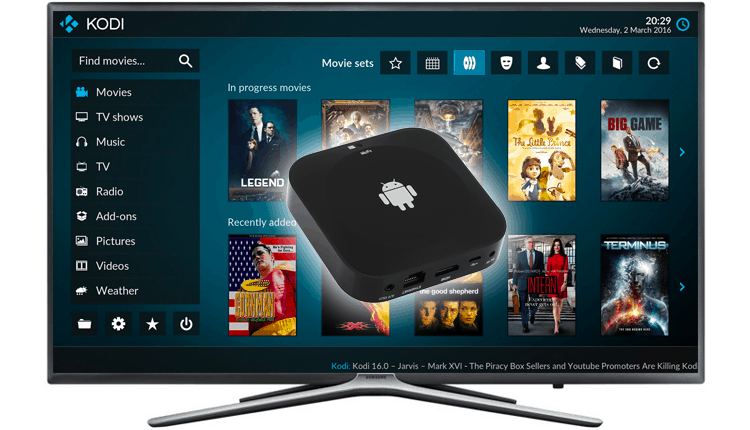 What is Kodi & Android Box? While I’m assuming you know what these are already, just in case let’s give you a quick review. Android boxes run Google’s Android Operating system and have access to the Google Play Store. They are available from quite a few different vendors and locations – but I’d recommend you take a look at Best Android TV Boxes as they have some good units available with Kodi preinstalled. Kodi is an entertainment center – it allows you to connect to your local network and stream content that you have already saved and stored, but even better it allows you (through the use of add-ons) to stream TV and Movies directly to your Television bypassing Cable and Satellite companies and their hefty bills! If you don’t know how to use Kodi, here’s the most complete Kodi guide to get you started. How do you Connect an Android Box to the TV? Android boxes come with an HDMI cable and really all you need to do is plug that cable directly into your TV. If your TV does not support HDMI you can easily purchase an HDMI to AV converter online or at your local electronics store. Plug the supplied power adapter into your Android TV box and turn it on using the supplied remote. Follow the simple onscreen instructions to connect to your home WiFi connection or use a hardwired Ethernet connection for an even better streaming and viewing experience. If you don’t get any wifi screen, just access settings -> wifi to connect with your home wifi. Click on the Kodi option on your screen and follow the steps below to start enjoying free content like movies, tv shows, live tv channels and much, much more! Before we get into a lot of detail about some suggested add-ons one, that is almost an absolute must is a VPN. VPN’s act like a tunnel between your device and the destination server. This tunnel helps to keep you anonymous and ensures that your ISP does not throttle your bandwidth based on ever-changing government regulations. However, while the anonymity is a huge plus, another factor to consider when using a VPN is its ability to unlock geo-blocked content. This sounds complicated, but let me make it easier … Netflix has a specific catalog of shows that are available in the USA, a different catalog in the UK and yet another catalog in Canada. Each country has specific criteria around what shows can and cannot be shown in their region, and these decisions are often completely arbitrary. However, if you have the ability to unlock this through the use of VPN, you will be able to access even more content than you would have had access to previously! Installing add-ons can seem daunting to anyone the first time it’s done. However, it is really a simple matter of conducting a few steps (which will become extremely familiar over time) in sequence. A really good video guide that is available is on the link below. Start with that first as it will show you what I’m going to be doing. As these add-ons are not on the play store, you need to ensure that you allow your Android box the ability to install them. Open Kodi and navigate to the system menu – this is accessible via the icon shaped like a gear on the top left corner. Go to system setting > add-ons and click the option entitled unknown sources so that it is selected. Once you have installed all of the add-ons you want to, you can always come back and uncheck this box. Kodi add-ons are stored in repositories on different servers around the Internet. Once you have found the repository with the files, you’ll need to follow these instructions to install them onto your system. Go back to the system menu (gear menu on the top left) and navigate to file manager. Select add source by double clicking on the option. On this screen click on the pop-up message that reads <none> and type in the address of the repository (we’ll give you that later). Give this source a name that makes sense and then save it. Go back to Kodi’s main screen and select the add-ons section – this is an icon that looks like an open box. Select install from zip file and then navigate to the repository you are interested and double-click on it. Wait for the completion message. Go back one step and select install from repository and then within the repository look for the add-on your interested in. Double click on this add-on to install it and wait for the completion message. Some add-ons will require additional configuration (like usernames and passwords) – you can do that from the configuration screen. You can find all of the video add-ons in the Video Add-Ons section of your Kodi home screen. There are lots of different add-ons available (with a host of different repositories) and some are better for Movies while others are better for TV and yet others are better suited for Sports. The best thing about Kodi is that you are not restricted and you can actually install as many or as few add-ons as you need to, to get the programming you are most interested in. We’ve created a list of some of the best Kodi add-ons that you should start with. It’s important that you refer to this list frequently as while the positive of Kodi is the multitude of add-ons available, the downside is that sometimes they stop working! We will keep the list as up to date as possible to ensure that you always have access to the latest and greatest. In some cases, add-ons that are working perfectly simply do not work on your device and you get error messages. Frequently this issue is because the contents are geo-locked (if you recall I explained what this is earlier) and you are attempting to watch a program or access content that is not accessible in your region. To rectify this issue, you need to have a VPN in place. I explained what they are earlier and at a very high level how they work, but most problems of this nature can be resolved by installing a VPN on your Kodi box. We’ll always recommend IPVanish especially with the discount we’ve managed to obtain, but even if you do not go with them, you really should ensure that you have a VPN on your Kodi box. IPVanish just may be the fastest VPN provider out there, and you need as much speed as possible to stream. There are free VPNs, but they use slow servers and then the streams would be constantly buffering. With IPVanish you will get the best VPN experience available for the most competitive price. Yes, they are totally legal, you have the right to stay anonymous. We’ve arranged an EXCLUSIVE deal with IPVanish to give our readers 57% discount. Just click on the button bellow. Access All Kodi Add-ons Now! Just bought a new Kodi box. Will not connect to anything, tutorials show click on Kodi logo and ‘Bam’, there it is. For us, there is nothing. What’s up? While I can use the box in one bedroom it will not work in another bedroom,what am l doing wrong? I have a box that we bought from someone and they did the set up. I have two issues the first is we keep getting broken links or we will be watching a show and it will pause multiple times. Vary annoying. The second is how can I tell if they had put in a ipvanish on my box. The streams stopping may be because of the stream itself, your internet speed or your ISP blocking you. The blocking issue can be solved with ipvanish. You will need to subscribe IPVanish here and then install the IPVanish app in your box. Do I have to have a vpn on each box ? I have 2 boxes , I’m planning on using. This was very helpful. I needed a guide “Installing a TV box for DUMMIES”. It was detailed and in simple language I could understand. The video are a big help but need to be slower showing more detail for us dummies. I never use a Tvbox I just bought one U2 will I be able to record staff from the Tv to HHD through a USB cable.? Will it work with just WiFi or it HAVE TO BE plugged to Ethernet cable? Hi Wilmer. These TV boxes are used just for streaming, not for recording. I believe there are ways to do it but I prefer to not enter in that topic as it can be used for piracy. I use Exodus regularly but lately it’s been very difficult to use it as all I’m getting is ‘no stream available’. I’m not very technical therefore I don’t understand and I’m very frustrated. You should try the new Exodus called Covenant. i just bought a new android box (Nexbox A95X) because I love my old one and needed one for my other TV. The first one was preloaded with kodi and worked great and then all of the sudden kodi and all my add on’s just disappeared. I bought another box and it doesn’t have kodi anywhere. I downloaded kodi and it shows that it s installed but when i click on it, it says app not installed. I have tried everything and searched countless forums. PLEASE help. Hi Steve. You can install Kodi / update using Play Store. The reason why you lost your addons were maybe because of an update, or your build was discontinued. You can always uninstall Kodi and install it again. Then just follow some tutorials to install your favourite addons or build. How can I get closed caption to work on my mini tv box? I have tried to go into all update areas and it looks like it is on, but it is not. Please help. I just bought a MXQ Pro. When I try to watch some movies, it asks me to pair in order for me to access the movie. I usually get this issue with openload source. How do I pair? Hi. That should hust happen with Openload, I recommend you to open other sources. I was fI’ll owing along with the video, which was great ? but when I went to select a movie to watch it’s come up with “Playback failed” one or more items failed to play. Check the log file for details. hi. Have you tried the Exodus addon yet? I just got ott tv box h.265. I’m looking forward to using it. I have a question. Can this box be connected wirelwireless? We have an article about the Best Sports Kodi Addons. I have tried EVERYTHING AND NOTHING WORKS. I have an MX android box that came with everything pre-installed. I accidentally reset the whole box and now it has nothing on it…. have tried backing up a different box and restoring it on this one, doesn’t work. I have tried installing from a zip file using all the tvaddons.ag and xbmchub etc…. i go to addons and I can’t even install the addon installer…..NOTHING WORKS. I suggest you start with a new Kodi Installation, where you can download from kodi website https://kodi.tv/download/ – choose Android ARM version. Then install Addon Installer on your Kodi, and then use addon installer to install other addons. Try to go to SYSTEM – Add-ons – My Addons – Video Addons – Exodus – update. Do that for the addons that stopped working. If the addons are not in “My addons”, then you will need to install it again. I recommend to use the Addon Installer, which you may have already under Programs in your Kodi installation. Hi, have had our Leelbox since Dec. And love it, our contract with direct tv is over next month and cant wait to be able to cancel our cable. I talked my aunt into gettimg 3 of them, one for each of her tvs. We have the same question though. We have both gone to add ons, enabled certain ones and a few we tried putting in favorites But dont know which favorites it goes to, we looked througb them all and couldnt find them. Is there a add on favorites folder or list somewhere we are not seeing it? It cumbersome to go through an entire list of preloaded add ons just to get to the ones I enabled. Note: after reading everyone elses frustrations of having to install the add on installer then find add ons I have to just be thankful for what is loaded. Hi i purchase a box and it has no apps on it so now I’m setting it up what apps for movies and tv show do you recommend I install? Hi Amy. That’s normal, now the manufactures don’t sell it fully loaded with addons anymore because it’s illegal to sell them like that. I have a streaming box with KODI pre installed, but I don’t know how to get Live TV on the box or the banner. Can you please help me. I need step by step instructions. I’m 72 years young and trying my best to stay up with technology. You can select another server from the list instead of openload. Liam click on exodus and a list of things will show. Open tools then click on playback. On the right side it will say hosters with captchas. Turn that off and you won’t receive any more pairing. Ok, got the box hooked it up following the above video everything is fine go to movies using channel 1 like you said in video and no videos will play says err. Can’t find link. It appears in the bottom right hand corner it also says see log for more details. Then I tried a few more and same thing over and over. The last time it said err 1 channel err, check log for details. You can try to update the addon. If doesnt work, just uninstall and install it again through the “Addon Installer” addon. Channel 1 isn’t easy to setup, the exodus addon is a good replace. Can you please help me with steps on how to install amazon prime video on my android tv box? What do you suggest for live TV? I would like to watch ABC, CBS but when I click on these through ustvnow nothing opens up. It says “loading” and then that disappears and I am back to the channel selection screen. Thank you. You need to go to ustvnow website and subscribe for free. Then you need to login in your ustvnow addon and you may also need to subscribe IPVanish to mask your IP to an US IP if you are outside of USA. Hi! Your video was wonderful in helping me figure this out. However, we got it mostly for sports games, but i cant seem to find the ‘digitele sports’ addon anywhere! Is there a way to download it or add it to the box? Thank you! Don’t you mean SportsDevil? You can install it through “Addon Installer” under Programs. i am unable to watch full screen movies or videos on the browser. I have Kodi MXQ Pro. Do not know what s wrong. Full screen button on the browser does not make the full screen. Do i need to install any app or it will never work on the browser. On the browser? Why do you need to use the browser? You can watch anything through Kodi or an app like youtube. You may be trying to play flash players, which have some incompatibilities with mobile devices. Hi. Did you try Exodus? If exodus doesn’t work there is something wrong. Please make sure that your box is connected to the internet. Try to open chrome browser in your box and access any website to test if it’s a problem with internet. If your internet is working and exodus is updated, you should be able to access and stream without any problem. Where do you find exodus? I did those steps above? I can’t make a movie play either! Follow the steps to install addon installer. Then open Addon Installer (located under Programms) -> search by name or author -> type exodus -> Click and install. Then you will find exodus under Video -> Video Addons. Recently purchased my ott box. All worked fine when upstairs plugged in had latest movies and add ons worked. Moved it downstairs and now the add ons won’t load it says uk turks playlist error check error log. I’ve tried uninstalling it and reinstalling it. Also updated exodus but still won’t work. Please help? Can’t you access Exodus movies / series? Or just Uk Turk? On UK Turk you may be trying to access Geo Locked content that you can only unblock it using a VPN. Hi, I recently bought a MXQ Pro Box with all the Apps fully loaded onto it, I plugged in the Ethernet cable and HDMI and turned it on, Joy as it was working fine, I managed to start watching programs and films that I hadn’t been able to watch before via Exodus app and Phoenix app. However when I went to watch via Exodus late yesterday evening I had noticed that the Apps looked different and the Apps within the App was now missing, It looks as if it somehow reset to factory settings as I had to Addon Kodi app which I didn’t before. Does the MXQ Box upgrade in the background when not in use? How do I get the Exodus App to work as when I added it, it says no steaming available for Exodus? Do I need to do a full factory reset? Hi Bob. Thanks for appreciating my work in this blog. Can you please explain your problem in a different way, I didn’t understand. Let’s make it work then. 1- First thing to try is to go to kodi > system > add-ons > My Add-ons > video add-ons > click in the add-on that is failing > click update. 2- Subscribe the VPN that I recommend in the end of my article. The VPN will make your traffic anonymous and your ISP wont be able to block the streams anymore. If the solution 1 doesnt work, the solutions 2 will definitely work. Hi Lochs. Looks like yours Friend ISP (internet service provider) is blocking him. In this post I recommend a VPN, take a look, that will fix your problem, because your ISP wont be able to track your traffic when is enabled. Hi, I’ve recently bought this box and it has kodi installed already, but it won’t let me watch anything, movies, cartoon, sports, tv channels, what can I try? Try the Exodus addon. If it works, it means that the addons that you’re trying to access are geo blocked, so you need a VPN. If Exodus doesnt work, it means that you may need to update the addons, to do that go to settings – addons – my addons – vídeo addons – select the addons you want to update and press the update button. I can’t get either remote to connect please help!!! Which remote? The normal or the mini keyboard? 2 – For mini keyboard you will find a mini USB close to the battery, plug it in your box and turn your remote on. 3 – if it still doesn’t work, contact the vendor. Did you try more streams to see if you get the same error? Hi hope you can help I have a Mxq box I can not get into setting to connect for Internet what comes up is kodi setting. To go to the settings of your box, you have to do it outside kodi, in your main screen. I’ve bought the ott tv box m9x..but when I go to GOtomovies or genesis or phoenix, when I click on movies, nothing shows. When I find movies on other apps (1channel) and click on it, it shows an error and states I should check the log. But where is that log? Genesis is now discontinued. I recommend you to use Exodus. Phoenix always worked, you just may need to update it (go to settings – addons – my addons – video addons – Phoenix – Click Update. 1channel is a geo locked addon, which means that you need a VPN like IPVanish. Exodus is not geo locked and for me its the best addon for movies and tv series. I cant for the life of me get this to work anymore. When I first got it I had a few problems with some channels but generally Exodus worked, Stream all Sources and some others. But now none of them work. Generally I can get into the channel list and get into the genres or search or list by type etc, but then when I click one of these options it doesn’t load up any shows/movies. That should mean that you need to update your box firmware. On the box main screen go to settings and you should find some update option. Hi, I have Installed my box but when I Open one channel and click through no movies or TV shows show up? Hi. 1Channel is a geo blocked addon, which means that you need a VPN to geo unblock it. I recommend IPVanish. I have just bought the Trongle X3 and with all the tutorials about i have managed to install addons. You guys are very clever and thank you for your time. That happens a lot, but its not a problem! If you want to exit from kodi and go to the box main screen, just click in the home button in your box remote control. If you want to turn your box off, you don’t really need to close Kodi, you can just turn it off in the power button in your remote control. Hope it helped you. Hi got the mxq box recently , exodus is already installed on it and show box but I either get streaming unavailable or log file error , my dad has the same box which I Just go on videos and it searches through many providers to find any film and then plays it for you without any problems . Any ideas on what may be the problem ? The solution is to use a VPN like IPVanish or use a addon that doesnt restrict by geolocation. I recommend the Exodus addon. Bet you and your dad have differnet broad band suppliers. BT wont allow the Kodi box to work on theirs. You should try an addon that doesnt use geolocation. An excellent addon: Exodus. Or if you want to watch content blocked by geolocation you need a VPN. I highly recommend IPVanish VPN. HI I have my android MXQ all set up but when I go to a Movie or show it will not connect due to URL? I suggest the Preyda Q-box . Excellent price for the quality. Then I suggest you to use Exodus addon to watch movies / tv series, Sky wont block these sources. When you’re inputting your WiFi password, how do I get the keyboard on the screen, to go “upper case” so I can input numbers too? It seems that there is no field available to input numbers! So if your existing WiFi password contains any numbers, you can’t set this device up at all? What’s the solution, please? Hi can not get key board up on m8s Kodi box to input Internet password ,can you help please. I’ve just bought an infinity tt TV box and I can’t even get bbc 1 I can’t get no channels films or anything. I did want to get rid of my Sky TV so I’ll be returning this waste of money pretty sharply unless you can help. Hi just bought a Mxq box but once it’s plugged in it does not load past the mxq start up page. Any advice? There is something wrong with your box. I recommend you to return the box and buy some box from the top listing in this blog. Please use our forum next time. Kodi is to stream content, not to download. If you want to download and store in your box you can as well, but you need to download from a website / service that allow you to download the film. You can also use your PC to download and pass it to the box with an usb drive. The keyboard has an usb in the back, plug it to the box, turn on the keyboard and you should be fine. If still doesnt work try to charge the keyboard, it has to work. Hi can someone help please. We have purchased a tt gv box with the plan to watch programmes etc on it. However we have issues when we try to use 1 channel or Phoenix, it’s not actually playing anything. It shows the tv or movies option but keeps coming up with an error. I’m getting ready to throw this box out the window! I’ve see you have recommended IPVanish, how do I go about doing that so can use the box? Treat me like an idiot as I truly have no clue ? If it doesnt work you should try a vpn. Yes I recommend IPVanish. You just need to find it in Play Store and install it. And then buy a plan with them which is very cheap and login in your app. Then to mask your IP you just need to select a country in the IPVanish app. If you are with one of the big ISPs in the UK, have you remembered to turn off parental controls through your ISP account. If you have Virgin Cable, it is called Virus Safe. If you have Sky, theirs is called Sky Shield, etc. I’ve just bought one of these and plugged it in , the blue light is on but my to is just playing as normal , how do I get the box to work? You mean to connect the TV with the box? And than how to change it? I have just got my mxq and when I go onto kodi, I get xfinity talk and nothing just blue screen, no option boxes like TV, movies,sports,system. I have satellite which I want to cancel…I going to try and connect my kbox should I unplug the satellite when I try to connect the kbox to the TV. All I need to do connect the HDMI to the box and TV and plug it in is that right….I have xfinity for Wi-Fi will that work…. I’ve setup an MXQ Kodi box and everything seems ok until I select a movie or YouTube etc. The following message appears: Upload Error. Can you please advise how this can be resolved. It looks like it’s some internet connection problem. Did you try to open Chrome Browser in you box and access a website? If it doesn’t work it can be because you didn’t put your wifi password correctly. If your TV has a HDMI port, then yes you can. How can I get hobo for free. Did you install IP TV list? If you did everything alright you may need a VPN (I suggest IPVanish in the end of my articles). Just bought XBMC MXQ box,have connected it to the HDMI input on the TV and plugged in and it wants to keep turning my tv on and off.Do I have to disconnect my Sky box? Hi Rachel. You need to plug a Power Adapter. Didn’t you get one in the box? Which tv box did you buy btw. The safest is to buy a box that we recommend in this blog. Cannot get KODI as set up shows on YouTube please explain why not. Hi Terry. Which box do you have? if you buy a box from a link shared by us in this blog, you’ll have kodi pre-installed, as we just recommend Boxes with kodi. Maybe you bought a box without Kodi installed, so I recommend you to search in youtube how to install it. It’s not that hard. If the problem is the country, it should mean that is your new internet service provider that is blocking content. You can always use a VPN like IPVanish and set it to other country. Do you have Phoenix installed? if you don’t, before use a VPN, try to install it and see if it works for you. I cannot get this work work. I have loaded onto my TV and when trying to select the films it just whirs for literally a second saying loading then nothing more. Tried the other channels ie cartoons etc and nothing will load very disappointed as recommneded by three others and they had no problems at all. That normally means that your internet provider is blocking the servers that provides that content. I suggest you to try other addons like phoenix, it normally works fine at least with virgin media. Project Free TV worth a try too. If it keeps blocking your content, I suggest you to use a VPN like IPVanish and choose USA to mask your IP. It will solve that. Hope I helped you, enjoy!